A bunch of fights that make this boxing weekend special. This, for me, is one of the best boxing weekends of the year so far. Everywhere you look you have top notch bouts, most of them 50/50. Let's take a look at some of the fights this weekend where it's just too hard to pick a winner. 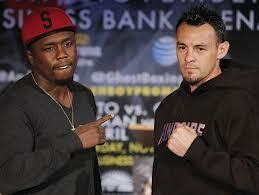 Robert Guerrero Vs Andre Berto - This is a great fight, Guerrero, the slick boxer, against Berto, the explosive puncher. Speed and power is with Berto, but experience, stamina and activity is with "The Ghost." The fact that Berto has been inactive for fourteen months may persuade most fans to give the edge to Guerrero. But it's very tough to split them. Ricky Hatton Vs Vyacheslav Senchenko - If we're talking prime for prime, Hatton is the overwhelming favourite, but I don't see how Ricky Hatton can be in his prime after what he's been through the past couple of years. Senchenko is a solid operator, but not a world beater, the outcome of this fight does depend on which Ricky Hatton shows up. Scott Quigg Vs Rendall Munroe - This all British clash has already happened once, unfortunately for us fans, it ended very early due to a clash of heads. It's still not clear who the better fighter is, Munroe won round one, Quigg won round two. Expect a close fight between two world class Super Bantamweights. Keith Thurman Vs Carlos Quintana - Rising Knock-Out artist Keith Thurman, takes on his toughest test to date when he steps into the ring against Carlos Quintana, a slick southpaw, who held the WBO Welterweight title back in 2008 when he beat Paul Williams. Quintana has taken away two "0's" in his career, he's more than capable of making it a third. But with seventeen KO's from eighteen wins, Thurman has the power to hurt Quintana, who has been stopped three times before. So we have four very good 50/50 fights this weekend, enjoy each one while they last. Tell me who you think will win in each bout by leaving a comment below. You can also predict who you think will win each fight in our Boxing Prediction League here.